Home » BJJ Belts & Promotion » Why do some adults earn green belts in Brazilian Jiu-Jitsu? Why do some adults earn green belts in Brazilian Jiu-Jitsu? A few BJJ schools and associations have added a green belt for adults whom go between white and blue belt. The most notable instructors to use the adult green belt are Robson Moura, Saulo Ribeiro, and Ricardo Liborio. The green belt was likely added to break up the time white belts have to wait before their first “real” promotion (other than stripes). 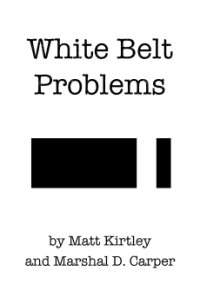 White belts are often very frustrated by how long it can take to earn a blue belt, with the average time being 2 years (see How long it takes to get a black belt). The IBJJF doesn’t recognize green belts for adults. A green belt is usually reserved for kids as the highest belt they can earn before turning 16. When visiting other schools or entering tournaments, adult green belts are still considered white belts. Because of green usually being a child’s rank, and because people in BJJ often scorn the large number of belt ranks given in other martial arts, the adult green belt rank is sometimes scoffed at. That said, the main instructors who issue them are highly respected. Should an adult green belt switch to a gym that doesn’t use the rank, the new instructor may allow them to keep wearing it, or have them switch back to a white belt. If they do switch to a white belt, the instructor may award stripes to show that they do have experience.